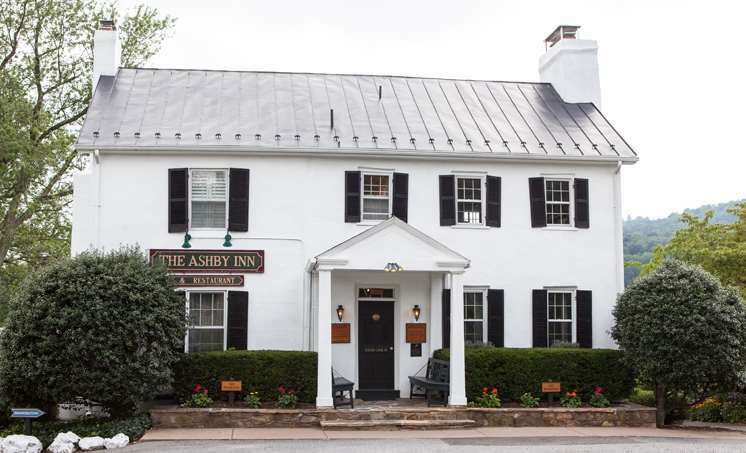 The 1829 Ashby Inn & Restaurant is nestled in the quiet village of Paris, Virginia (population 67). Just one hour west of Washington, DC, the inn is at the very center of our country’s dynamic first century and is located within minutes from over one dozen wineries, the Appalachian Trail, and the quaint towns of Upperville and Middleburg. From George Washington and the Marquis de Lafayette to Stonewall Jackson and John Singleton Mosby, the village has played an integral part in the lives of those who shaped America. The inn with six rooms, opened in 1984. Eight years later they converted a former one-room school house to four large guest rooms, each with a private porch commanding sweeping views of the Blue Ridge foothills. Long regarded as one of the very best restaurants in Northern Virginia, the Ashby Inn, offers a daily menu that is limited, thoughtful and inspired by its own gardens. It is fully committed to supporting the farmers and artisans that live and work in this region. The restaurant’s menus represent the freshest, seasonal products that can be sourced locally from sustainable operations. The offerings will change daily in concert with what our local farmers and nature provide. Their pledge to you is to provide a quality dining experience founded on food and drink from sources they know and trust. The inn’s ten guest rooms vary in size and decor. Each is furnished with 19th-century pieces, including four-poster beds, hand-painted wardrobes, quilts, oriental rugs and blanket chests. Four rooms have wood burning fireplaces. Outside the inn you will find Adirondack chairs, long manicured lawns lined with beautiful perennial flower beds and the inns vegetable and cutting gardens. The grounds are luxurious and impeccably maintained. The rooms are comfortable and attractively furnished with antiques and handmade quilts. But it is the food at the 10-room Ashby Inn that guests remember the most. We can tailor a reception to most any whim and budget. A professional staff will assure that every detail is handled to your specifications. From recommending a photographer to hiring a horse and carriage, we can arrange a flawless afternoon. Enjoy a bottle of red, white, or sparkling wine selected by our Sommelier! 3-course dinner for 2 & a room in the School House: Wednesday, Thursday, or Sunday. Cannot be combined with any other offers or used on holidays or pre- existing bookings. Offer expires May 31st. (04/03/18 to 05/31/18).